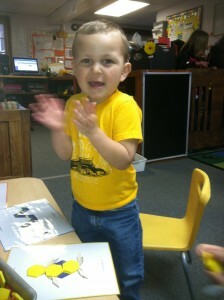 Day care at Playmates Learning Center operates Monday through Friday from 7:00AM to 6:00 PM. We serve children ages twenty-five months and over. We are open year round but are closed for major holidays. Teachers plan an experiential, hands-on curriculum which meets individual and group needs. We utilize many of the same educational materials which are used in Preschool and Kindergarten. Children go outside daily, weather permitting. A computer is available to children with a wide variety of educational software. Children who require naps have a rest period after lunch. Other children may attend preschool or have a quiet period in daycare. Parents provide a nutritious lunch and Playmates provides milk or juice. A microwave is utilized to heat foods if necessary. The daycare teachers set up a schedule of when children can have a microwaveable lunch as there is not enough time to microwave lunches if every child brought them on the same day. Medication is stored and administered in accordance with the State of New Hampshire regulations. “Child care agencies shall not administer prescription medicine to a child unless the medication is accompanied by written authorization from the parent and the written order of a licensed health practitioner. Child day care agencies may administer non-prescriptive medication to a child only when the medication is accompanied by written authorization from parents.” Forms are available in daycare for this purpose. When children have accidents, a form is completed describing how the accident took place, who saw it happen and measures taken to alleviate the accident. Medical emergency numbers are placed near phones in the event an ambulance needs to be called. Parents of the child are asked to read the accident report and indicate whether they are satisfied or dissatisfied with the treatment given. Our youngest children have activiies in the classroom or utilize one of our two fenced in play yards. Older children go to the football/soccer field, softball field or to our bandshell to join in daycamps at Sandlot Sports & Entertainment. Keeping cool in our inground heated pool for eligible children is one of our favorite summer activites. Younger children play in our kiddie pools or have fun using our sprinkler system. Payment is expected at the beginning of each week that your child attends. Your balance is displayed on the data terminal when you sign your child in and out of the daycare. A file folder is available for checks or cash. If you pay in cash, please make sure that you get cash receipt. You may also make a credit card payment on line at our website, www.playmateslc.com. You will need to set up an account and a staff member will provide you with the security code to create your online account.